After Kavalier & Clay became a hit, comic book companies were almost immediately asking Chabon to either allow them to make a comic book spin-off of the noverl or have Chabon write a comic book himself. Here are comic book projects in the works or that have been published as a result of Kavalier & Clay. When Dark Horse Comics canceled The Amazing Adventures of the Escapist, it left a major dilemma. Plans had already been set forth to publish an on-going series of stories written by Brian K. Vaughan (Ex Machina), and already the first story was in issue #8. 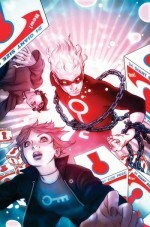 The second was ready for print in issue #9 when Dark Horse pulled the plug on the series. So what do you do when you have all that art and no comic? Make a new one. 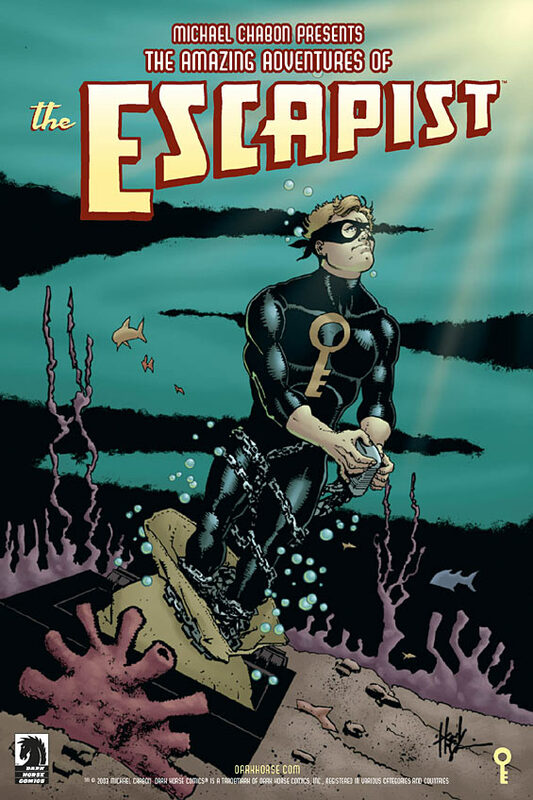 The Escapists #1 hit stands in July 2006. Featuring the art of Steve Rolston (Queen & Country) and Jason Alexander (Gotham Central), the six-part mini-series tells the tale of Max Roth and Case Weaver, two indie comic creators in Cleveland who decide to re-launch the Escapist comic. Chabon personally tapped Vaughan for the story line. “Michael Chabon is easily my favorite living novelist, so imagine my shock when I came home to a message on my machine from him, which said, ‘Brian, I’m calling with urgent League of the Golden Key business,'” Vaughan said on his blog in April 2005. In February 2004, Michael Chabon Presents: The Amazing Adventures of the Escapist debuted. The 80-page quarterly featured stories by various comic book creators and involved the various fictional comic book characters featured in Kavalier & Clay, including the Escapist and Luna Moth. Each story took place in a different time period from the golden age to the modern age. Chabon personally supervised all of the stories and also contributed original stories of his own, including a script for a story about Mr. Machine Gun in issue #7. Other creators involved included Elektra‘s Bill Sienkiewicz and Howard Chaykin (American Flagg!). Chaykin and Chabon previous worked together on McSweeney’s Mammoth Treasury of Thrilling Tales. He will provide both the front cover and a 10-page story. Chabon told Entertainment Weekly in September 2003 that the comic would feature the history of the character from 1939 to present. “There’s a point in the ’60s where the character is in dispute, and ends up in the hands of a company that produces hair-care products for an African-American market,” Chabon said. However, declining sales meant eventually the comic would have to die. Dark Horse canceled it in January 2006. Many of the remaining stories later showed up in The Escapists. I agreed to do it because they gave me a chance to write one of my favorite costumed super-hero characters, Mr. Terrific… If you don’t know about Mr. Terrific, and I’m not making this up, he has no powers. He has no powers. But he is really good at stuff. On his chest instead of the usual symbol, he has the words, ‘Fair Play.’ It’s kind of a Wes Anderson kind of a character. So I asked if he was taken – because this is sort of a book where there are different writers for different characters — and when they said he was still available, I said I’d do it. 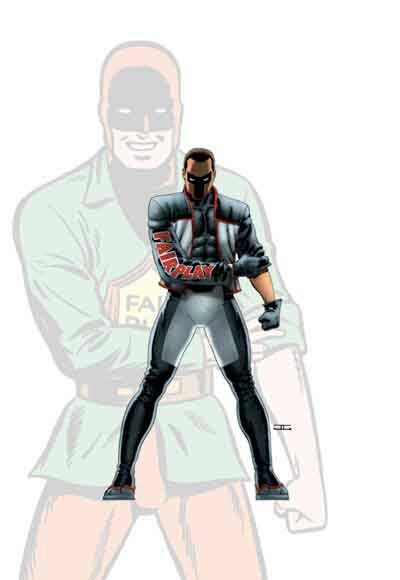 What I wrote about was Mr. Terrific’s younger brother, who was not so terrific, and what it’s like to have Mr. Terrific as a brother. The issue hit stores November 11, 2003.